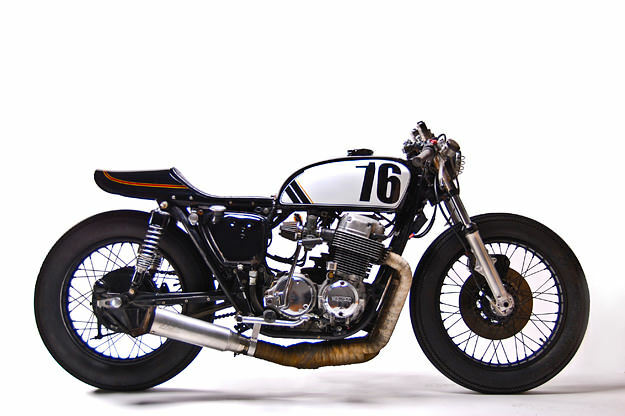 This 1976 Honda CB750 is owned by Jon Brindley, a champion of the Washington DC music scene. 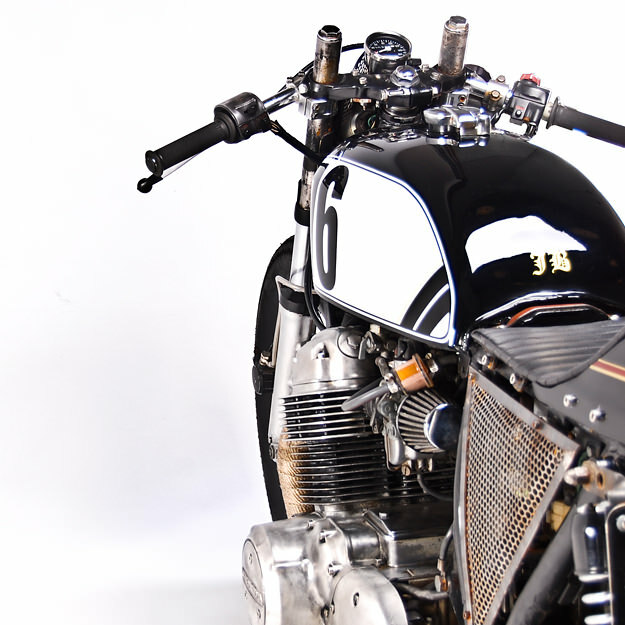 Jon also happens to be a friend of MotoHangar owner Pat Jones, which explains why the bike looks so good. It’s an interesting mix of sharp graphics and authentic patina, and it didn’t happen by accident. “Jon was quite adamant about having the bike show its age,” says Pat. 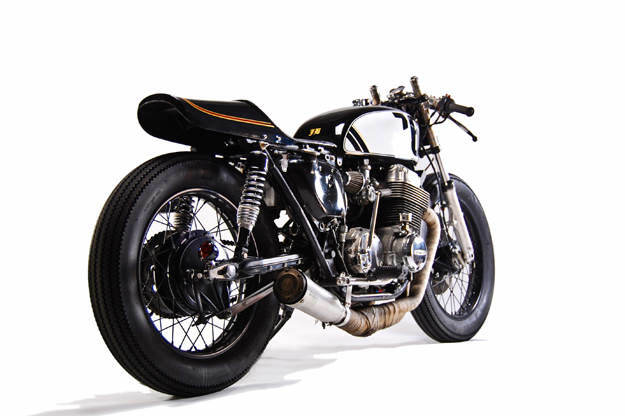 “We went back and forth on this one, discussing ideas.” The modifications that the pair eventually agreed on include a Kawasaki KZ tail, jet black paint, ceramic header wrap, a SuperTrapp exhaust and cone-style air filters. 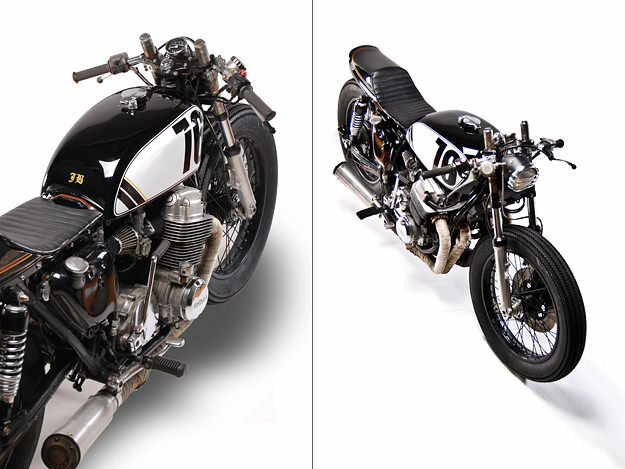 To improve the stance, the CB750 has been lowered just over an inch at the front. Adding to the retro vibe are a Suzuki trials bike headlight, a low profile leather seat, a leather tank strap and powdercoated wheels wrapped in Firestone tires. 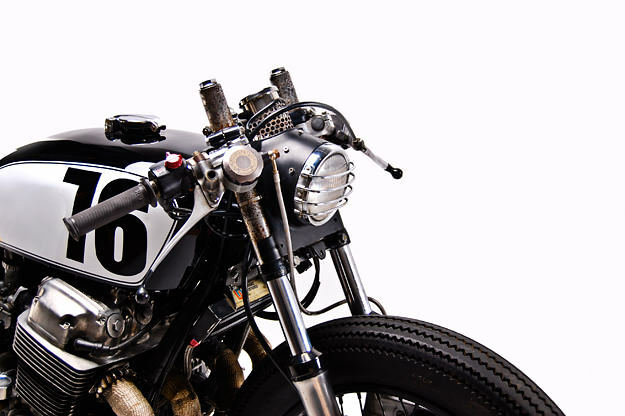 Everything was done in-house at MotoHangar—mostly by lead fabricator Matt Osburn—apart from the paint on the tank, a slick job from Royal Essex Custom Airbrushing in New Jersey. 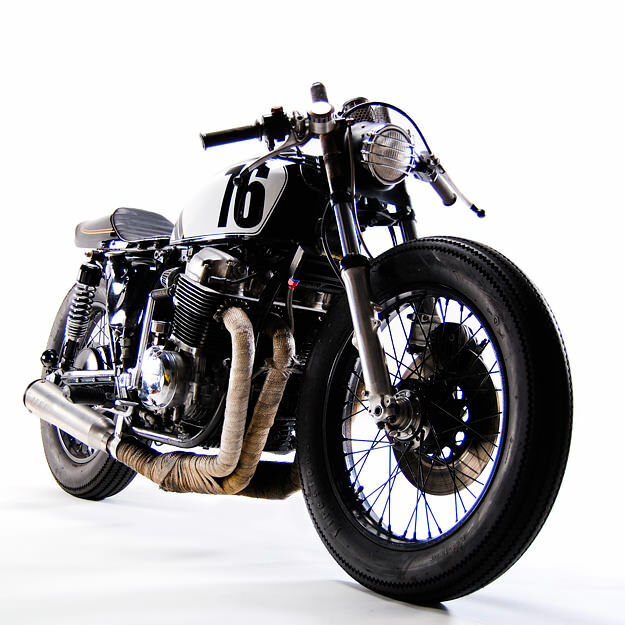 MotoHangar is no stranger to these pages: its Suzuki GT550 custom was our first featured bike of 2012. And judging by this follow-up, we’ll be hearing more about the Washington shop over the coming year. Images by Pat Jones/The Softbox Studio.